As lowside float valve, highside float valve controls the flow of refrigerant evaporator, on the basis of the level of liquid. In this case, however, the float Assembly is located on the side of the high-pressure metering unit opening. 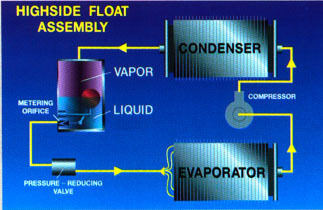 It maintains a constant level of liquid refrigerant in the condenser, or a little below on stream from it, as shown here. Differential pressure refrigerant passes after the departure of the condenser is a result of joint resistance to the flow on the two points. The pressure decreases primarily as a refrigerant passes through the holes in the float valve. Further reduction occurs as a refrigerant passes through the valve. Pairs of refrigerant vapour at the outlet of the evaporator becomes liquid in the refrigerator. The more evaporator cooling load, the more steam enters the condenser. 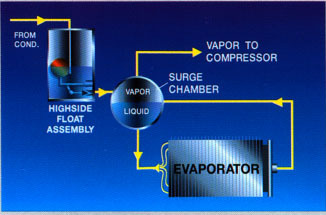 As a result of more vapor condenses into a liquid. As the liquid level rises, opens a metering valve allowing more liquid in the evaporator, coincide with the sum that evaporated. With the least load, less liquid evaporates, less steam enters the condenser, and less will be condensed. Decrease in the level of liquids metering valve to move in the direction of " closed". 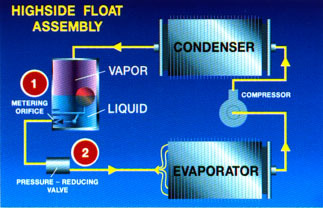 When the compressor stops, the steam leaving the evaporator is not sent to the condenser, and the liquid level in the highside float drops; this process is to close the valve. It remains closed until the start of the compressor and condenser accumulate a sufficient quantity of liquid in the float chamber to open a metering valve. As dry expansion evaporator (as shown above) and flooded evaporators (as shown here) to use highside float as the measuring device. The most common use is in the flooded cooler by the centrifugal chiller. When it is used in the flooded evaporator, liquid, leaving the metering device enters the surge, and not go directly to the evaporator. In the egalitarian, flash gas is removed at the compressor suction together with gas evaporated within the coil. Fluid circulates through the coil.